When Sophie’s cousin Danielle dies after a fall from her balcony, the police dismiss her death as suicide. She had broken up with her boyfriend and had suffered from depression in the past. Sophie isn’t so sure, however, and when she finds a memory stick in a pair of Dani’s old jeans, some new photos and information come to light that point to something more sinister. Sophie and her friend Reece investigate further and soon find out that Dani was involved with something very dark and very dangerous. As Sophie and Reece become more and more deeply involved they put themselves in huge danger too, accessing secret data, facing kidnap attempts, and worse. And as they uncover the terrible truth about what really happened to Dani, Sophie and Reece must also face their feelings for each other. 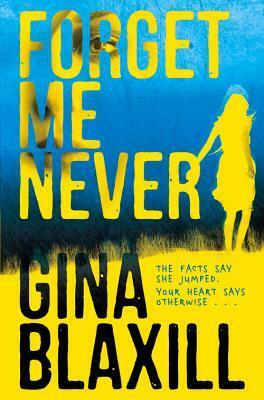 Categories: Crime, Romance, Social/Family, Thriller | Tags: Gina Blaxill | Permalink. Sophie and her friend Reece investigate further and soon find out that Dani was involved with something very dark and very dangerous. As Sophie and Reece become more and more deeply involved they put themselves in huge danger too, accessing secret data, facing kidnap attempts and worse. And as they uncover the terrible truth about what really happened to Dani, Sophie and Reece must also face their feelings for each other . . . Categories: Romance, Social/Family, Thriller | Tags: Gina Blaxill | Permalink.